Your wedding day symbolizes more than the bond between two people; it is the day a new family is created. If you or your fiancé have children already, then your wedding day should mean the same thing to them, a day when they become part of something new. As such, you probably have questions like: How can I include the children in the wedding? How can stepfamilies unite as one? is there a special wedding ceremony for a blended family? And, the answer is a resounding, Yes”! We welcome the Family Medallion Ceremony in all of it’s glory. Including children and stepchildren in the ceremony is a meaningful emotional image for them. It truly shows them the love and commitment that you have, that they are being welcomed into the family. The family medallion is a tangible symbol that their parent and new stepparent care for them. 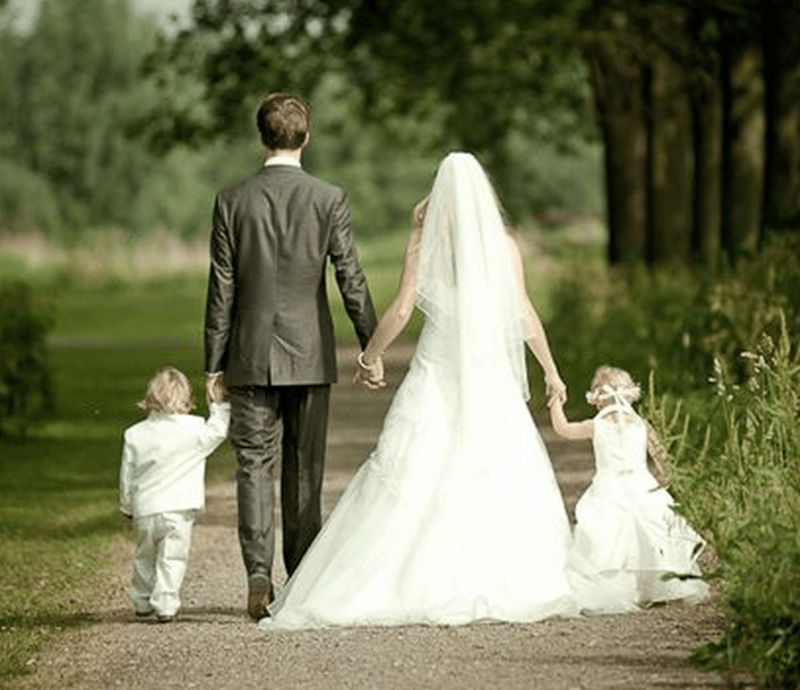 A quarter of all American weddings involve children from previous relationships. Over two million weddings are performed each year, which means that half a million couples need to decide if, and how, to involve their children in their weddings. With so many families blending together, it is becoming more common for the new commitment to these children to become part of the marriage vows that couples pledge publicly. So, What is The Family Medallion Ceremony? The Family Medallion ceremony is a meaningful way to integrate your children or stepchildren into the wedding of their parents. It is a simple, yet profound, way to show them that your thoughts and commitment extend to them. The ceremony gives a small token, a family medallion, to all of your children to represent that they are part of the new family and marriage. The family medallion itself has a symbol of three interlocking circles, representing the new commitment between you, your spouse, and your child. Like the wedding ring between husband and wife, the family medallion is a reminder to your child that they are a loved and integral part of your life and your family. The Family Medallion ceremony shows clearly that everyone is being integrated into a new family together. The Family Medallion ceremony parallels the ring ceremony; like it sounds, the Family Medallion ceremony is a simple ceremony that involves giving a token – a lapel pin, pendant, or ring – to your children during the wedding ceremony, with spoken recognition of the new and existing relationships that the family medallion symbolizes. It is a simple, short addition to the traditional wedding ceremony, only about five minutes long (which works well for the little ones with a short attention span!). It’s also interfaith, so it can work seamlessly with traditional Catholic or denominational weddings or civil ceremonies. The Officiant offers a small statement about the love and unity of a family and asks both the bride and groom to promise their love and support for their children and stepchildren. They then bring the children forward and present each of them with the family medallion. This kind of visual affirmation can be exceptionally powerful for your child. Frequently, children are excited or happy when they first hear their parent is getting remarried, but that can gradually change into more negative emotions — disinterest, anxiety, even antagonism. What they see in the wedding planning process is their parent moving onto a new life that may not visibly include them. They know life is going to change after the marriage – and they need to be comforted in how that change is going to affect them. The Family Medallion ceremony adds a special time, a special memory, for your wedding. There can be a danger nowadays in being too casual or too jaded about marriage, to forget that the wedding itself is a long-standing symbol of something else. It is a symbol of creation and of new life. It represents family. It can be difficult creating a new family while remembering and respecting previous relationships, but a moment in the service like the Family Medallion ceremony is a reminder that a marriage doesn’t do away with these old relationships: it unites all of them together into something new and special. There is even a unique Family Medallion Song, written just for you! STEP 2: PRESENTATION OF MEDALLIONS”] Typically done after the bride and groom is pronounced husband and wife. STEP 4: BRIDE & GROOM SAYS”]In presenting (this/these) Family Medallion(s), we pledge our continuing love to you… (more with the complete ceremony). These vows are only samples. Feel free to come up with your own personalized vows which will make the ceremony that much more meaningful, and very touching for you, your family and the wedding guests. Note: for children who cannot be physically present at the wedding, it’s nice to try to include them somehow. Consider purchasing a medallion and presenting it to the child to help him feel included as part of this new blended family. Be sure to make mention of him during the ceremony and record it to show him he was part of your family in spirit. God bless your new blended family. The never-ending circle of your rings symbolizes your never-ending love for each other.